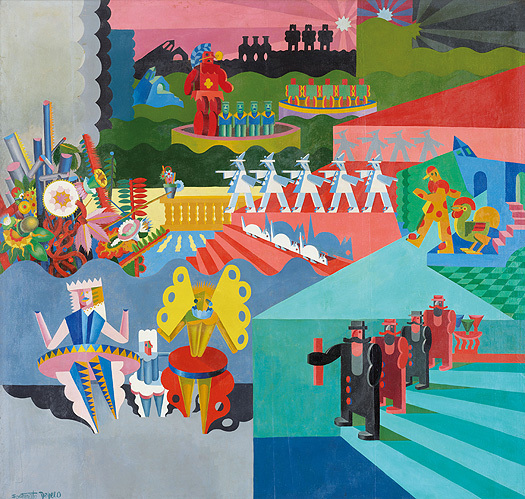 The Fundación Juan March is presenting the exhibition Futurist Depero (1913–1950). By focusing on the life and work of Fortunato Depero (Fondo, Trento, 1892 – Rovereto, 1960), the show aims to offer a new vision of what has been termed "the Avant-garde of avant-gardes": Italian Futurism. This visual and literary movement, which was launched with the manifesto published by Filippo Tommaso Marinetti on February 20, 1909 in the Parisian newspaper Le Figaro, has found its place in history owing to the radical nature of its proposals: abolishing the entire traditional focus of earlier art (considered purepasséism), glorifying dynamism, the machine, speed and war, freeing words from grammar, and multiplying viewpoints in order to express the dynamic interaction of matter with the space around it. During its peak years between 1909 and 1915, Futurism made an innovative and dynamic contribution to European visual art and literature. The outbreak of World War I marked a break in its activities, with many of the Futurists participating in the armed conflict and some being killed in action, including Umberto Boccioni. Prior to this, in 1913 Fortunato Depero traveled to Rome, where he met Marinetti and visited a Boccioni exhibition at the Galleria Sprovieri. His contact with the work of this artist and with that of Giacomo Balla led to a profound shift in his artistic output, as he assimilated Boccioni's visual dynamism and Balla's sense of tension arising from the abstraction of forms. In the spring of 1915 Depero was officially admitted to the Futurist movement. On March 11, 1915 Depero and Balla signed the manifesto Ricostruzione futurista dell'universo [Futurist Reconstruction of the Universe], one of the milestones in the development of the Futurist aesthetic. The text propounded a globalization of the arts and the fusion of art with all aspects of everyday life. But Depero was much more than just a painter who enthusiastically embraced the Futurist creed to abandon his early, Symbolist influenced work. He was an artist who constructed an entire Futurist universe, a multi-faceted, multi-media, all-embracing creative figure. Tirelessly active as a painter, sculptor, playwright, set designer, writer, poet, essayist, graphic designer and designer of adevrtising, trade fair pavilions, books, magazines, commercial logos, toys and rugs, he was a true cultural impresario, founder of one of the first artists' museums in the world (the Casa d'Arte Futurista Depero in Rovereto) and creator of one of the first artists' books in history, the famous "bolted" book. A visionary, in 1928 Depero left Italy to conquer New York, the city he called the "New Babel," where he lived and worked between 1929 and 1931, and to which he returned in 1948. Less well known on an international level than he deserves to be in view of the real importance of his work for the internal evolution of Futurism, Depero is a truly contemporary figure, a forerunner of what is now termed the multi-media artist, distinguished by a series of traits characteristic of contemporary artists, including the use of collective creation, self-publicity in the media and involvement in graphic design. Through more than 300 works from international institutions and private and public collections, Futurist Depero (1913–1950) aims to offer a complete and overall vision of the artist's work: "Tutto Depero," to use a phrase the artist employed in one of the last written accounts of his work.